Home / Uncategories / President Buhari Lied That Nigeria Army Used Kids Gloves When Fighting The Biafrans, Femi Fani Kayode. President Buhari Lied That Nigeria Army Used Kids Gloves When Fighting The Biafrans, Femi Fani Kayode. Former Minister of Aviation and a Peoples Democratic Party chieftain Chief Femi Fani-Kayode has tackled President Muhammadu Buhari for saying that the Nigerian Army was not hard on the separatist agitation of Biafrans during the 30 months civil war. 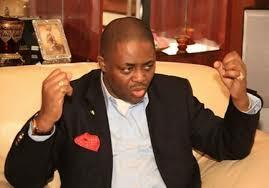 Fani-Kayode said that one of the most wicked and despicable lies that Buhari has ever told is that the Nigerian Army was restrained when fighting the Biafrans during the civil war. This is a lie from the pit of hell and it is insulting and deeply offensive. President Buhari speaking at the Presidential Villa, Abuja on Monday during his investiture as Grand Patron of the Nigerian Red Cross Society (NRCS) had explained that they had strict and formal instructions to exercise restraint against Biafrans during the three-year civil war which took place between 1967-1970. But Fani-Kayode on his Twitter handle said ‘One of the most wicked and despicable lies that @MBuhari has ever told is that the Nigerian Army was restrained when fighting the Biafrans during the civil war. This is a lie from the pit of hell and it is insulting and deeply offensive. ‘We must learn from our history and never repeat its mistakes. Was the Asaba massacre in which thousands of young boys and old men were slaughtered an act of restraint? ‘Or was the killing of 2 million innocent Biafran civilians and the starving to death of 1 million Biafran children an act of restraint? ‘For God sake where is our humanity? Must we lie even about our history and try to revise it? ‘No wonder they banned the teaching of history in our schools. Too much to hide! ‘The truth is that if not for the fact that the same group of people have called the shots in our country since 1966 every single commander of the Nig. Army during the civil war including @MBuhari, would have been charged with war crimes and crimes against humanity at the Int. Court of Justice at the Hague by now for the atrocities they committed against the Igbo race and the Biafrans during the civil war. ‘I don’t need to be an Igbo to admit that. ‘I just need to be an honest and objective historian and a God-fearing citizen of the world.We must ask God to forgive us for what we did to the civilian population in Biafra and we must NEVER allow such a thing to happen again.